Blake spent hours listening to Granddaddy spin'n tales about Mistress Lil, a century-old wild sow, who rambled the woods in the rolling foothills of Eastern N.C., finding lost children and weaving spells. Blake, proving himself a venturesome fellow, took to wandering the woods, tho' his granddaddy told him "if you start searchin' for Mistress Lil, you'll never find her -- lose your way and she'll find you." One day Blake's curiosity got him lost in a stand of hickory woods, where he sat down on a stump to think. Mistress Lil rescued him and sent him home with a story about that "stir'n stump." Years later Blake found that stump and that's where he stirred up the first batch of his bodacious sauce for a mighty Pig Pickin' that was so good even the pig approved. Blake's fame spread across the Carolina state line and now you can cook fresh pork roast, chop it up and stir in Blake's BBS Bodacious BBQ Sauce. Serve it with cornbread and cole slaw and treat yourself to a North Carolina Pig Pickin' delight. BBS Bodacious Carolina Style Gourmet BBQ Sauce is a marinade for pork, chicken, turkey, fish and vegetables like portobello mushrooms. Finish off the last 10 minutes on the grill with Aunt Jayne's BBQ Sauce for a hint of sweetness. It is also great to flavor up any cooked meat--sauced or dipped at the table. It adds zip as a bloody mary base or salad dressing base. Our "North Carolina Pig Pickin' Sandwich" starts with a chunk of sandwich bun, then shredded pork, "the sauce", and topped with cole slaw. This is a remarkable combination. Our BBS Bodacious Carolina Style BBQ Sauce is so low in sugar (1 gram carbohydrate per 1oz. serving) that diabetics and Dr. Atkin's dieters can use it. Is also low in salt. (120 mg sodium per 1oz. serving). Blake's Aunt Jayne had just chopped up, gathered up and mixed up all the fixin's needed to mix together another batch of Blake's famous Carolina Style BBQ Sauce, when she opened the cupboard door - only to see the vinegar bottle sittin' there empty down to but one dropIn a panic, Aunt Jayne ran outside, flung open the root-cellar door, and scampered down into the damp darkness. She lit up the oil lantern only to find the storage shelf empty of any vinegar. Pushing boxes and cans aside, behind all was found a big dusty sealed jug of dark red ketchup. The happy ending to Aunt Jayne's misfortune, was the creation of the very first, deep red BBQ sauce, the one we have all tasted over the years in so many various flavors and concoctions. But don't forget, Aunt Jayne's was the first, and "Original" thick dark red sauce mixed up in that old "stir'n stump" of Blake's. 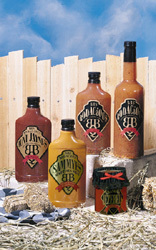 The thick deep red sauce is best on grilled or baked chicken, ribs, and hamburgers. Be sure and have extra on the table for dunk'in each bite or on cooked chicken from the grocery store. Low temperature, slow cooking is best, so the sauce dosen't scorch. Brush on the last 10 minutes of grilling. Marinate chicken and ribs then bake or grill. Grandma Jezebel descended from a long line of Southern ladies who gave rise to the expression "Southern Hospitality." She was a feisty lady, whose family referred to her as one of the last of the red hot mama's - in and out of the kitchen. We believe that Grandma Jezebel's Sauce is a true testament to her culinary creativity and reflects her passionate personality. Spread a bit of cream cheese on a cracker, and top it with a bit of Grandma Jezebel's Sauce. Close your eyes and open your mouth wide, your're in for a tastebud tantalizing appetizer that will please your craving desires. It may be diluted with apple juice and used as a dip for egg rolls. If mixed 50/50 with mayonnaise, it will make a great sandwich spread for ham, turkey, or shrimp dippin'. Stir some of Grandma Jezebel's Sauce into some of your favorite baked beans to create your own secret recipe. Dip coconut shrimp or shishkebobs into this special sauce for a real kick. With amight unusual likin' to mustard, Sammye regularly covers everything with her "Yellow Sunshine". One day last fall, "The Mistress of Mustard" flung open the pot belly stove and smothered the then cookin' dinner with her latest yellow creation. She stoked the fire with an apron full of fresh fallen leaves and when dinner was served, Sammye's Sumptuous Sauce had such "Zing" it made everybody's toes curl right up. Try this tantalizin' sauce on a ham, pork roast, or chicken for an outdoor BBQ indoors! Don't forget eggroll dippin' and sandwich spreadin' are mighty fine, too! Hamburgers, hot dogs, and french fries love this spanky sauce. That ole' bull broke out of the back 40 and charged the homestead, scattering man an' beast alike. He was so mean and unfriendly, he ended up in the smokehouse. With a bit of hickory smoke and a little swamp sauce, that ole' bull turned out finger lickin' good and was the start of a Bodacious new taste treat. On Burb's last hunting trip, ( Burb who? He is Blake's long lost 2nd cousin twice removed), he got so many turkeys they wouldn't all fit in the ice box on the porch, so he put them in the smokehouse. Some of the good ole' boys brushed a bit of kickapoo joy juice on them and a lipsmackin' taste was born. This low-calorie, low fat, finger-lickin' snack is so good you'll be beggin' for more. All our BBS Bodacious Jerkies are a healthy snack with no refrigeration required. The meats are top round steak or real turkey breast with no nasty chemicals (contains NO MSG, Sulfite, Nitrite, BHT or BHA), nasty by-products or artificial preservatives. Jerky can be chopped fine and put on tossed salads or on baked potatoes as a real flavor, low fat, treat.